← Conquest Through Determination Releases!! 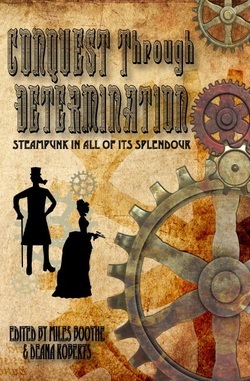 This six comes from my story in Conquest Through Determination, a steampunk-themed anthology from Pill Hill Press. My story is called “Clockwork Nessie” and features a strong-minded young woman named Lizzy. She has just discovered her recently departed father left behind a secret science lab on Dog Island in Loch Ness. She and her servant, Robert, rowed out to the island to investigate and have just arrived at the hunting lodge, which appears to be deserted. She’s undaunted that’s for sure. Thanks. Congrats on the release! I love the name Lizzy. Will always love that name. She likes to take risks. Curious how that will work out for her. Intriguing. Lizzy is so Pride and Prejudice. I love it too. Thanks for dropping by. I love the way that girl thinks! She’s going in, isn’t she? Sensational six, C. Is this available in eBook yet? Of course she’s going in! 🙂 Not yet on the Kindle book…sigh…they said it would be in a week or so. A week is today, but they usually do offer in ebook so not sure what the hold up is. LOL. That’s a damned good way to get shot. Haha…we strong-willed women probably have said this and ignored far more dangerous signs too. THanks! She sounds a rather proper miss with very improper ideas. Good on her! Fun six this week, Claire. Sounds like Robert wants any excuse to leave. Oh well, Robert has quite a few things on his mind. Hmm… Thanks for visiting. Now if only the sign had read Trespassers are Likely to be Shot! Lol … I think Lizzy is unlikely to be deterred in either case. Great six! You’re right. It wouldn’t have mattered a whit to Lizzy. Thanks for mosying on by, R.
Love your dialogue – – and the way she things. An thoroughly entertaining six! “Trespassers may be shot”: I think I would take my chances too. ; ) I love the characters’ steampunk-esque dialect. Makes them more memorable, even from a six sentence teaser.